The Stuart McElrath Company upgrade an existing website or create one from scratch. 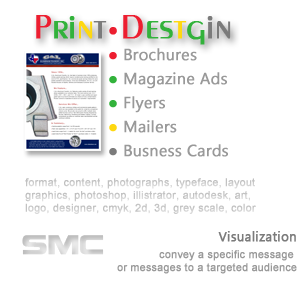 SMC can provide various types of printed materials for their customers including, brochures, business cards, flyers and mailers. Your website is the first impression a potential customer receives concerning your company, its products and services. You want this first impression to portray your company's identity at its best. The Internet has become your main communication tool for what you offer to the entire world and we know that a poorly designed website is worse than not having a website at all. Our web design capabilities will give you the keys to optimize your company's image and adapt it seamlessly to the Internet. Information SMC will meet with the customer to gather the necessary information to build the website. Planning SMC will develop a sitemap and with logical divisions of information and relevant sub categories. Design SMC will provide design examples of the proposed website’s pages, such as home, content, contact, etc. for the customers review. Development SMC will take the concept examples and implement them in the in the actual code used by webservers and browsers. Maintenance SMC will work with the customer to develop the appropriate maintenance program. 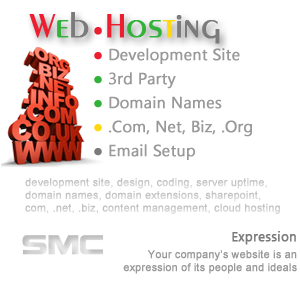 Hosting During the design phase, SMC will host the customer’s development web site on its own servers. Need brochures, flyers? SMC can take customer's existing artwork and convert it to high resolution for printing or to a lower resolution for pdf’s for the website or emailing. When combined with website design, SMC can take artwork used on the website to make brochures, flyers, business cards and letterheads that are uniform in design. 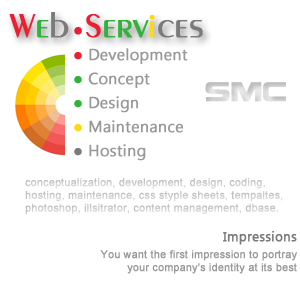 During the web design and development phase, the SMC will host the customer’s development web site on its own servers. This will allow the customer access to their web site during the development phase so that they can review the content and follow the site’s progress. Once the site has been designed and is ready to be published to the full internet, SMC will work the customer's existing web hosting service or help them find a suitable hosting company if this is their first site.